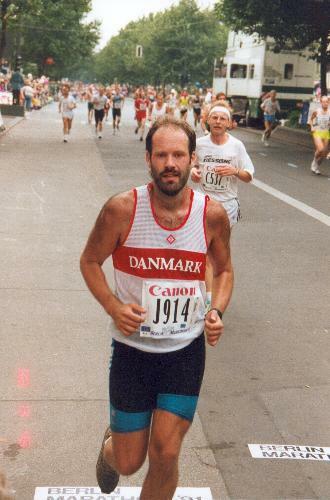 By the end of 1989 I started running, as part of my training for the mountains, and within a few months I became a member of the Sparta athletics club, my local club which during the 90'ies became the most important athletics club throughout Denmark. After a year or so I started to participate in races, and as a Sparta member I had to wear the club clothes, at least when participating in club races. But I also used my lycra club shorts in other races, like here in the 1991 Berlin Marathon which I finished in 3:13:48.